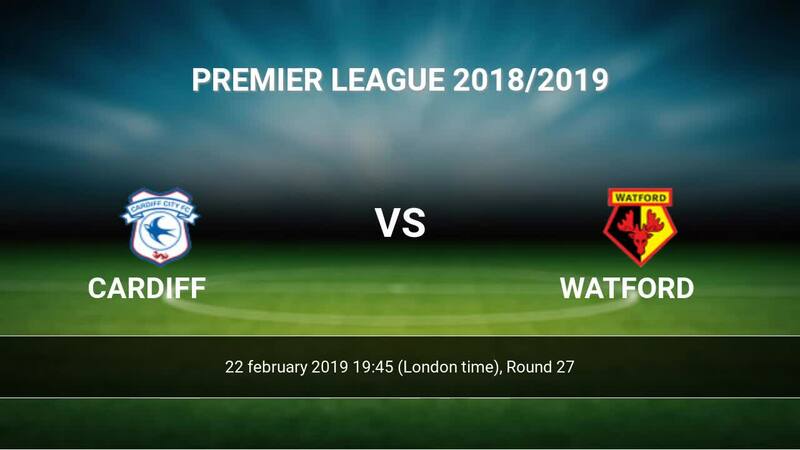 Kick off Cardiff-Watford in Premier League on today 19:45. Referee in the match will be Simon Hooper. Team Cardiff currently is on lower place in table (17 position). In 5 last matches (league + cup) team gain 7 points. Not lost the match from 2 games. Leading players Cardiff in Premier League is: Bobby Reid 4 goals, Callum Paterson 4 goals, Victor Camarasa 3 goals. Most assists in the club have: Bobby Reid 2 assists, Callum Paterson 1 assists, Victor Camarasa 3 assists. Team Watford is located in the middle of the table. (8 place). Last 5 games (league + cup) finished balance 8 points. From 2 matches away can't win a match. Watford has not been defeated from 2 matches. The best players Watford in Premier League, who scored the most goals for the club: Roberto Pereyra 6 goals, Troy Deeney 5 goals, Andre Gray 4 goals. Most goals developed: Roberto Pereyra 1 assists, Troy Deeney 2 assists. Injured players Watford: Success Isaac, Kiko. The match will not occur Jose Holebas because they are suspended (cards, etc.). Direct matches: Watford won more direct matches. 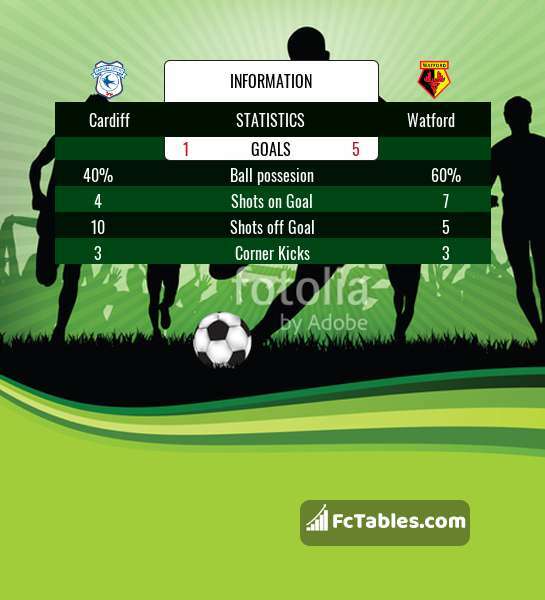 Cardiff won 8 matches , Watford won 8 direct matches, was a 6 draws. In 17 matches the sum of the goals both teams was greater than 2.5 (Over 2.5), and 19 matches teams scored more than 1.5 goals (Over 1.5). In 16 matches the both teams scored a least one goal (Both teams to score).